I was born in May of 1986. My Tio Sergio passed away from AIDS only a few months before. Growing up, I knew that he passed away from AIDS, but it wasn't until my adult life did I truly realize what that had meant. I remember going to an event as a child and seeing these quilts people had made in memory of those who lost their battle to AIDS and meeting Julia Light, an actress from one of my favorite shows as a kid, Who's the Boss. Although I never got to meet him, I have been told he was nothing short of amazing and today I know I can do something, even if its a little bit, to help prevent others from sharing their stories of losing loved ones to this. If you can help me reach my goal of $1,500 that would be great. If you want to just send me a text or post saying you support me and my efforts, that is worth just as much. Love you all! Hope to see you on the path! I will be walking with some of my partners from my Starbucks location, Rte. 66 and Vermont, in Glendora. You are more than welcome to join us! But we will also be representing Starbucks LA Central Cal team so join your local friendly baristas in this fight! 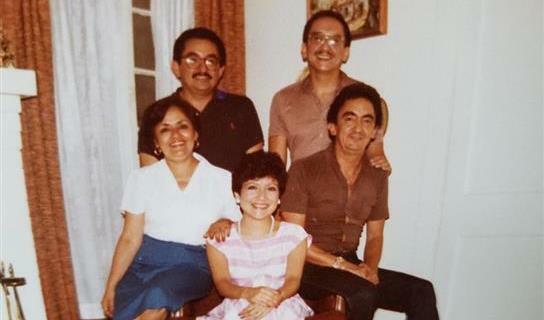 My Tio Sergio (top right) and his siblings, including my mum.